Presented the national program that will bring civil society and NGOs to the UN Conference on Sustainable Development (Rio de Janeiro, 20-22 June 2012). To emerge from the global crisis, we must return to putting human being at the center. The richest countries must reduce consumption of resources. Colombo (AsiaNews) - Creating new job opportunities for young people, respecting the environment and enhancing women's role, to emerge from the global crisis while respecting the human being: these are the qualities that civil society and NGOs in Sri Lanka will bring to the Conference of Nations World Summit on Sustainable Development in Rio de Janeiro (Rio +20, 20-22 June). Gathered under the name Civil Society Concerns, civil society organizations and 33 NGOs have organized a press conference to explain their program. Representatives of various organizations examined the status of Sri Lanka, then expanded on the world situation. Rio +20 is the result of the historic United Nations Conference on Environment and Development held in 1992 in the same Brazilian city. Despite the problems caused by three centuries of British colonization, the socio-political situation in Sri Lanka has evolved quickly. However, the country has never managed to find an inner balance, due to religious, language, class and caste barriers. Added to this 30 years of civil war. "The conflict - says Civil Society Concerns - has affected millions of people across the nation. We had between 80 thousand and 100 thousand victims, especially in the northeastern provinces, over 300 thousand refugees." Although Sri Lanka is now considered a lower middle income country, poverty is still a serious problem and about 23% of the population lives below the poverty line (1.25 U.S. dollars). And the lack of involvement of the poor, women and young people does not help Sri Lankan society evolve. In addition, note activists, the state also faces a serious environmental problem. "Most economic development programs - states well-known environmentalist Sajeewa Chamikara - do not follow the environmental laws." This is putting at risk not only the natural beauty of Sri Lanka, but also "its very development." 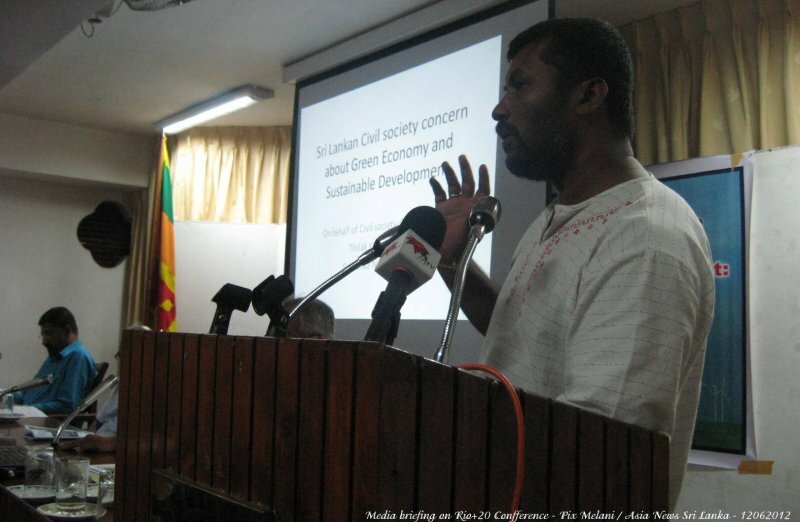 Even internationally, the situation looks very different, as explained by Thilak Kariawasam, President of Sri Lanka Nature Group: "A big part of the agreements made 20 years ago have not been implemented successfully. The result we see today: the world is facing a larger environmental, economic and social crisis than ever before. " According to Herman Kumara, president of the National Fisheries Solidarity Movement (NAFSO) and special invetee of the World Forum for Fisher People (WFFP), the failure of the agreements "are the fault of the biggest and richest countries, who are playing geopolitical games and are not willing to go the root of problems. Beyond the rhetoric, these nations are not ready to tell their peoples that we must change and make sacrifices, for fear of losing power. " Mudslide in Sri Lanka, the State "knew, but did not warn the people"